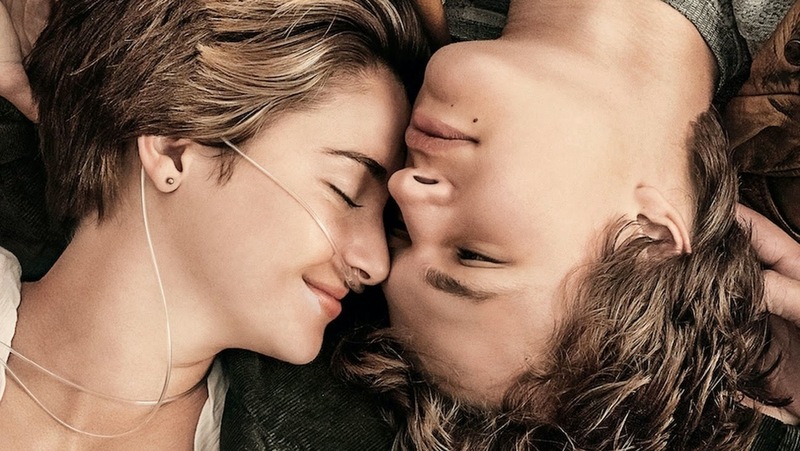 The Fault In Our Stars, a cinematic adaptation of the Young Adult phenomena, commences with a cynical lie, hits a handful of misjudged notes and occasionally treads in uncomfortable, perhaps exploitative, ground. Yet, in between these sour patches, Josh Boone has created a rare movie of euphoric empathy and ecstatic sincerity. The love story, for those not familiar with one of the more famous romances of our times, begins with a meet-cute collision at the most unlikely of locations - a cancer support group. Overwhelmed by her instant attraction to a dashing stranger, Hazel (Shailene Woodley) retreats to the bathroom to fix her appearance. A ruffling of her short hair is followed by the tender straightening of the cannula in her nose. In this moment she is slight, fragile and brittle - not in the manner of one in the throes of cancer, but rather akin to any teenager experiencing the first chapters of young love. It is the film's stand-out moment. Despite an disingenuous opening monologue which suggests that The Fault In Our Stars would be entirely different from the teen movies that came before it, Josh Boone's film fits neatly into the upper echelons of cinema's Young Adult fiction canon. A disparaging reference to Peter Gabriel seems peculiarly perverse as we meet Augustus Waters (Ansel Elgort) - an earnest romantic lead who calls to mind the sublime creation that is Say Anything....'s Lloyd Dobler. He makes no bones about telling Hazel exactly how he feels: about her, about life, about the universe. His earnest proclamations are as disarming as they are engaging. Hazel is smitten. Having lost a leg to cancer, but ultimately recovered, Augustus is one of the few people Hazel believes to understand her plight, her situation. Her parents, in an effort to console Hazel, send her to religious support groups and everyone is obsessed with helping her "journey". Hazel's days are numbered, it is a medical miracle she has made it through to her seventeenth year, and the only adult who appears on an empathetic wavelength is Peter van Houten (Willem Dafoe), the mysterious author of her favourite book "An Imperial Affliction". With impeccable detective skills, Augustus is able to track down Hazel's reclusive, enigmatic hero and arranges for them to meet in Amsterdam. Hazel needs answers to questions about his novel which ends, mid-sentence, with the assumed death of its protagonist. When she's gone, Hazel wonders, what happens to all the characters around her in the book? The parallels between van Houten's tale and Hazel's own, it would be safe to say, are immense. Boasting a pair of charming lead performers in Woodley and Elgort, once the film has accepted its not the deeply subversive movie its opening monologue suggests it will be, The Fault In Our Stars truly comes alive. Sure, there's sarcasm and mockery of patronising, protective attitudes but what makes the film flow as well as it does is the manner in which it recalls some of the greatest aspects laid down in the teen romance genre over the last three decades or so. There's the love of outsiders as patented by John Hughes, the honest humility of Cameron Crowe and the muted decency of Adventureland all on display here. It is this, the unabashed love of its central characters, that shines through. Hazel Grace Lancaster is a character we come to feel; her suffering becomes ours. As the two teenagers fall in love, so to do we. Its the gentle, under stated moments which gives The Fault In Our Stars its heart - when it does attempt melodramatic set pieces, such as an amorous instance in Anne Frank's house which some may find offensive, is when Boone's movie feels at its weakest and least truthful. But then a line like this will follow: "I fell in love the way you fall asleep: slowly, and then all at once". All is forgiven. Watching this film in a packed multiplex theatre reminded me entirely why I fell in love with the medium of cinema. Oftentimes I will find myself in almost empty screenings full of cynical older men looking for artistic value that simply isn't there in austere "experimental" features about trains - this was the exact opposite. The Fault In Our Stars is an event movie in which the young adults came together to share a visceral empathetic reaction to art; a wonderful reminder of how films can connect us, about why they matter. As Augustus wooed, throngs of life responded with yearning sighs - the characters onscreen and the crowd of adoring eyes looking up were bonded with exquisite feeling. And what is cinema if not a tool for helping us understand our place in the narrative of the universe? Whilst the representations of cancer may, despite protestations otherwise, have been largely sugarcoated, that is not the point of this movie. Josh Boone's film exists to help us understand grief, tragedy, loss, longing and, more importantly, life and love in a manner audiences will understand - the realism of suffering is not important here. Moving pictures about people and their lives, their tales and how they can relate to ours, are the humanist principles upon which cinema was founded. This is a delirious and somewhat humbling reminder of that.